You might have noticed that since last November the engineering and science themed daily RF Cafe header images have been much larger than those which graced the pages in the past. The change was motivated mainly by a desire to make them more viewable on the tiny screens of mobile phones. It also gave me the opportunity to include more information. In the process, I took the occasion of being on each engineering and technology daily history page to check on the validity of the long ago included hyperlinks to pages which validated dates of events. Use of Wikipedia was avoided because of the joke-worthy reputation it had for bogus information which was either made up by pranksters or simply regurgitated from other inaccurate sources on the Web. I thought Wikipedia was past that, but evidently based on a recent discovery there are still instances of bad data. 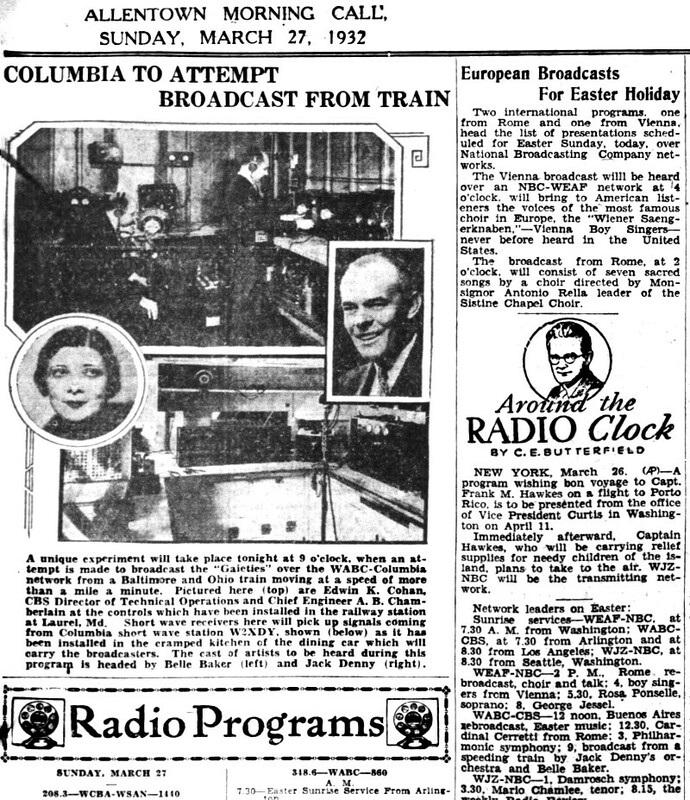 While creating a new RF Cafe day in history header for March 24, I tried to look up the web page where I originally got the date for the world's first commercial radio broadcast from a moving train. The feat was accomplished by station WJZ out of New Jersey, while aboard a Baltimore and Ohio (B&O) train. The URL was dead, so I looked to Wikipedia as a new authoritative source. March 24, 1932, was confirmed as the date on more than one Wikipedia page. Since I wanted to use that event as the theme for the day's history graphic, I did more searching to look for a picture, but to no avail - just more reiterations of March 24th being the day. 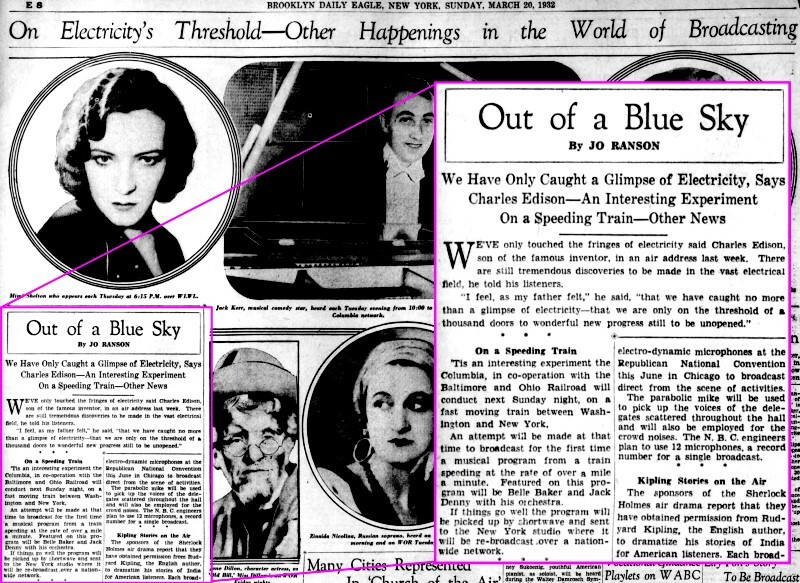 So, I decided to use my Newspapers.com subscription to look for old news accounts of it. 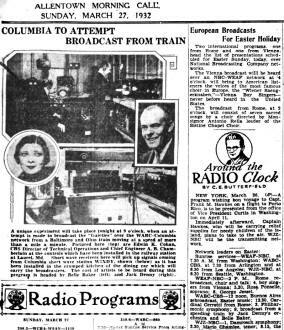 Without exception, every newspaper of the day reported the broadcast as occurring on Sunday, March 27, 1932 - not the 24th. It was Easter Sunday. 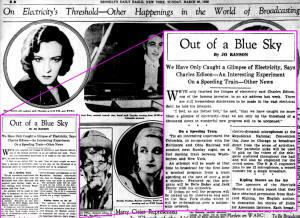 The Allentown Morning Call reported the event in its Sunday, March 27, 1932 edition. The Brooklyn Daily Eagle announced the upcoming trial in its Sunday, March 20, 1932, edition, and finally The Ithaca Journal-News reported on the success in its April 14, 1932 edition. Sure, it's not really that big of a deal, and not many people care at this late date, but the point of the story is that even though some websites have worked hard to try to parse "fake news," to use a popular phrase du jour, there are still plenty of places where it creeps in. Caveat emptor.